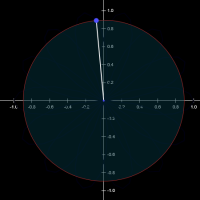 A circle is centered at the origin and its radius is defined by the distance between the origin and a point, P. P is defined by a polar function, r(t), and is located at the current value of t. Adjust t, or animate it by pressing ”go”. What is r(t)? Look at the .gx source for the answer. Hint: if you look closely, r(t) can be seen in dark blue. It is a particular ”polar flower”.